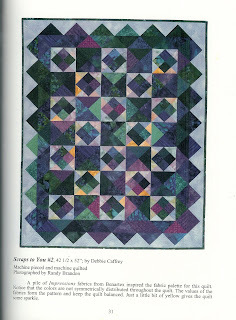 I started my looking at only scrap quilt type of books. And on the 5th book, I found it. ON the cover no less. The book is "Scraps to You, Too" by Debbie Caffery. The book is all quilts using the birds in the air blocks. I forgot I had it, what fun. I called Mary Ethel and told her, she is so excited to be able to finish this quilt. I will post a picture when it is finished. I machine quilt for her, so I know I will see it again.